Tadake Falls or more accurately Taa Falls (dake = falls in Japanese) has been on my radar for some time. 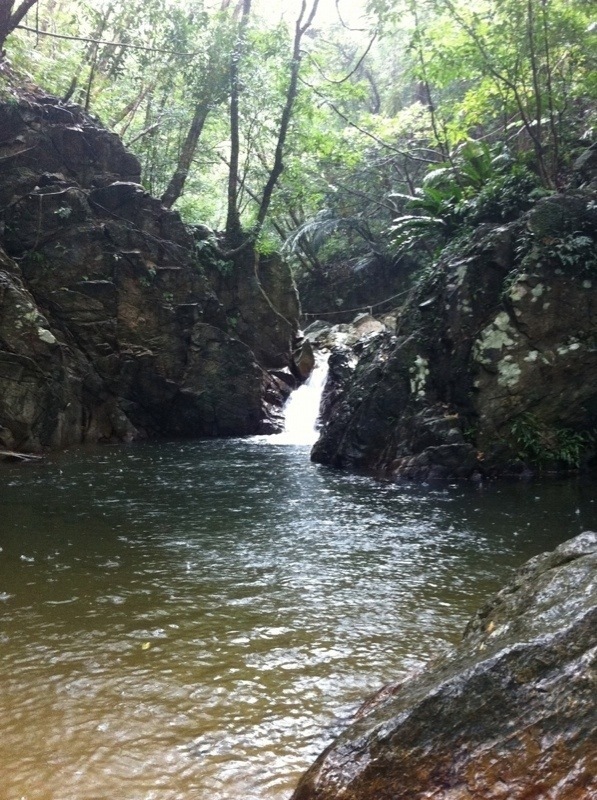 Due to it’s location and supposed brevity, it is one of the more popular “river treks” here in Okinawa. Given that I am on leave this week, and i had sketchy directions, I took the girls out for an adventure. Our original plan was to get up at the break of dawn and head to Nago (north west of the island), grab a quick bite and get on the river. Anybody who has ever been around my house on the morning of an adventure knows how that works. After 2 cups of coffee, 3 trips to the bathroom, and a couple of wardrobe decisions later, we were off. No big deal, Nago is only an hour away. The day was kind of gray with several bouts of sprinkles thrown in for good measure. Not bad weather considering what we were about to do. River trekking is just like hiking, only you guessed it, the trail is a river. We were going to be wet one way or another. That can be a blessing in hot and sticky Okinawa. We arrived in Nago just in time for a quick lunch. After refreshing our directions, we set off. Directions in Okinawa generally go something like this…”go to the third FamilyMart and take a left, you’ll see it” or “go 7.1 km, pass the Lawson’s, and take a right on the bridge with the heart hats”. That is literally what we had. Even so, we had little trouble finding it thanks to my manly sense of direction (Lol). The location is rural to say the least and no one else was there. Not a big surprise given the weather. After gearing up (and rejoicing that i finally had a use for my Vibram toe shoes, $100 water shoes anyone? 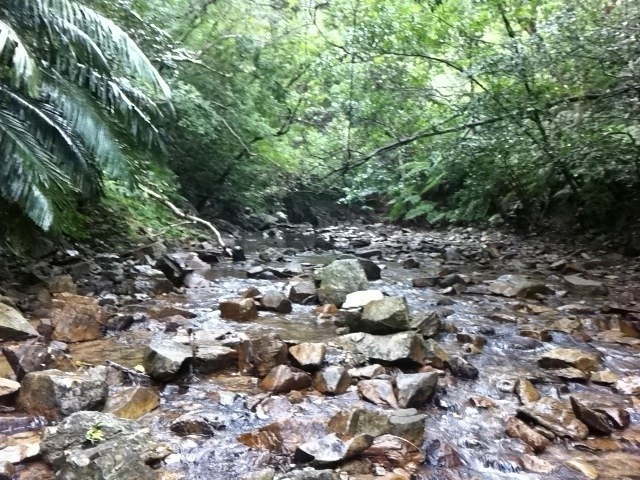 ), we started up river. First step in the water and I remembered a key fact, this is a spring fed river. 70 degrees year round. Brrrrrr. Cold but bearable. The river bed was mostly little pebbles with an occasional big rock, but nothing special. Should be an easy hike. This is the point where my wife realized that there was no paved walkway up to this waterfall and that we were going “up the river”. Fortunately for me, she was a gamer. Unfortunately for me, the river had a surprise of it’s own. The shallow calm water with little pebbles turned in to deeper water with big rocks and boulders. This was truly going to be an adventure. Do you ever have that thought ” Okay I’m here, but how in the heck am I going to get back down?”? Happened to me just after I helped all 3 of us scale a 15 foot rock face. The terrain had seriously changed. A quick walk up a shallow creek bed had turned in to a big time off roading adventure. 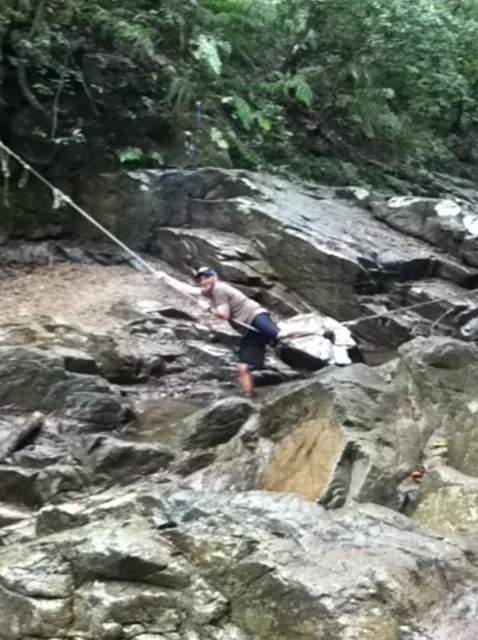 The rocks were slippery, the current pretty strong, and there was going to be some climbing involved. Shortly after we reached the point of no return (at least easy return), I heard “ahhh my ankle!”. Perfect timing. Something else you would know if you’ve been on adventure with us, Angela has to get hurt some way, some how. She also has to have a panic attack, but that comes later. Ang had gotten her leg wedged in between two rocks and scraped it up pretty bad. No cell phone service and we had just climbed a crazy rock. A crazy rock that was wet and we would have to go back down on a bum ankle. Did I mention all of the sharp pointy rocks at the bottom of the crazy rock? After a few minutes of rest, she declared she was okay and wanted to keep going. I have to give her credit, this was not an easy hike. Especially not on a bum ankle. I probably would have gone back. We did pass a Japanese tour group on the river, so I felt pretty confident that in case of trouble there was help around. Still, I’m not sure how we would have carried anyone out of this place. After an hour or so, we reached the falls. 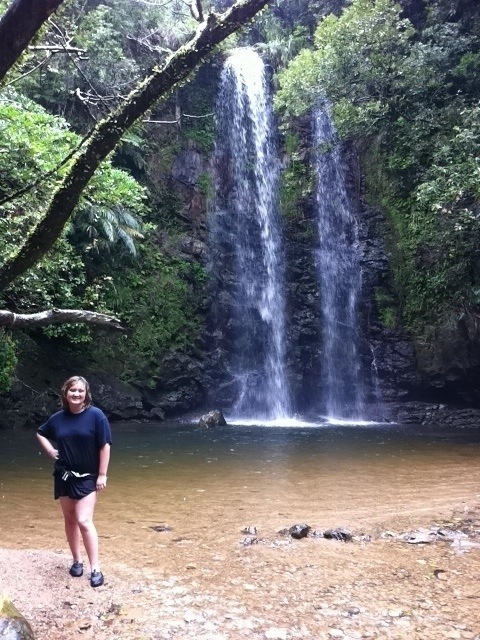 I have to say waterfalls are cool. Not sure why, I mean its just water falling? Does that in my shower every morning and no one is amazed. Still, when it falls off a cliff i n a jungle somewhere, cool. This one was around 100 feet high. We took a few pictures, relaxed for a minute, enjoyed the view, and then started back down the river. It was definitely faster going back, by 25% or so. The rocks were still slippery, and the current was not helping matters. And that crazy rock wall was on my mind. 15 feet up a slippery rock wasn’t so bad, 15 feet down a slippery rock….did I mention there were lots of sharp pointy rocks at the bottom of the 15 foot rock? I was a little anxious. Visions of an Aerovac danced in my head. “So exactly why did you let your child fall 15 feet and break both of her legs Mr. Wood?” “You thought it would be a good idea to drag your family up this river with all these slippery rocks?” ORM dummy, ORM! Turns out, it wasn’t that hard. We made it down like it was no big deal. Bum ankle and all. But just as my anxiety started to subside, Angela’s got cranked up. Turns out she likes to be able to see where she is putting her feet. Silly woman, on an overcast day in a flowing river you can’t see jack. And certainly not when you left your glasses at home. But just like the big rock, we made it through. Panic attack rating score: 3 out of 5. Once back to the calm, smooth river bed section, I took a few minutes to teach the girls how to skip rocks. We also got to teach Hannah how to change in a car. Ahh, the skills you pass to your children. Round trip time, 2.5 hours (the website I got directions from said it was a 20 minute hike, for who? Sir Edmund Hillary? Not us). This was by far the gnarliest trail we have ever done. It certainly beats out anything in Okinawa, and tops a few trails in the Smokies too. Hiking up a river presents unique challenges. Your footing is never that great and deep water makes everything harder. Angela and I both fell several times, losing cool points and some skin along the way. Hannah, who I am convinced is half mountain goat, never so much as slipped. That kid is a great hiker. I can definitely see more river treks in our future. Well, at least for Hannah and me. I think Ang wants to stick to paved trails for a while.